It’s time to hear the 2018 Jack Straw Writing Fellows at a series of three readings hosted by 2018 Writers Program Curator Daemond Arrindell. 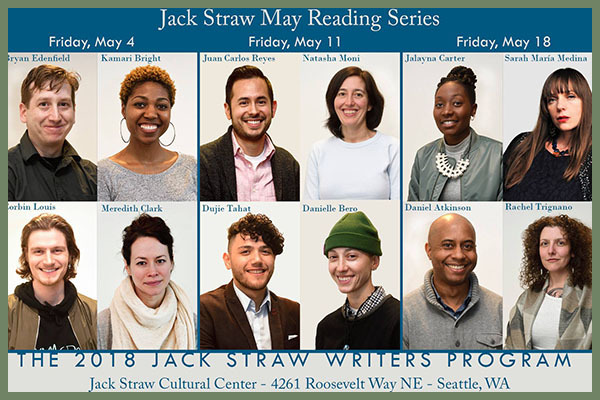 Held at the Jack Straw Cultural Center, 4261 Roosevelt Way NE, Seattle, admission to each reading is a $5 suggested donation, and comes with a gift of the 2018 Jack Straw Writers Anthology. A light reception will follow each event. On Friday, May 1, 2018, featured readers are Bryan Edenfield, Kamari Bright, Corbin Louis, and Meredith Clark. On Friday, May 11, featured readers are Juan Carlos Reyes, Natasha Kochicheril Moni, Dujie Tahat, and Danielle Bero. On Friday, May 18, featured readers are Jalayna Carter, Sarah María Medina, Daniel Atkinson, and Rachel Trignano. You could be as happy as Poem Booth winning poet Dayna Patterson (pictured above) if your poem is selected for framed display from June 1 to August 31, 2018, on the Forest Street side of the Community Food Co-op in downtown Bellingham. In addition to having their poem displayed, the winning poet will receive $25 cash and a $25 gift certificate to the Community Food Co-op. Please do not write your name or other recognizable information on your attached poem! No computer? 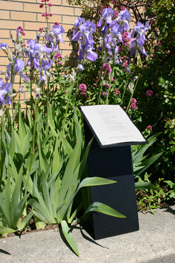 Mail your typed poem with a title and no other identifying information, plus a separate cover page with the title of the poem, your name, phone, mailing address, and email address, to Poem Booth, c/o Christen Mattix, 1133 Railroad Ave. #218, Bellingham, WA 98225. Runner-up poems will be posted on the Poem Booth blog. Copper Canyon Press has announced that a memorial for Sam Hamill will be held in conjunction with the official release of his final book, After Morning Rain (Tiger Bark Press), in Port Townsend on Tuesday, May 15, 2018, between 3:00 and 9:00 pm. (Read the title poem here.) For further details email MiddlepointPress@gmail.com. For those wishing to honor Sam, his family suggests a donation to your local Habitat for Humanity. Since tomorrow, Saturday, April 28, 2018, is Independent Bookstore Day, here’s another book bit: an illustrated article on 10 of the world’s best book towns in The Guardian. Check your local independent bookstore for tomorrow’s author appearances and other scheduled events. National Poetry Month is winding down, but not before Poem in Your Pocket Day (today!) offers you a chance to share some favorite lines. If you’re at a loss for poems (gasp! ), have a look at this one by 8th grader Michelle Carranza from Humanities Washington. What poem’s in your pocket today? At Hugo House, Shankar Narayan will read from his new chapbook, Postcards from the New World, and other works. Dujie Tahat, Troy Osaki, and Gabrielle Bates will open the evening with readings from their own work. At the same time (7:00pm), at Core Gallery, Leanne Dunic, Elaina Ellis, Amber Flame, Erin Malone, Lena Khalaf Tuffaha, Shin Yu Pai, and Holly Wren Spaulding will read their poetry from the Broken Broadsides exhibit. If the choice is too challenging, you could just split for points north and go to The Write Riot Poetry Slam at the Colophon Café in Bellingham! A year ago, we mentioned the Visible Poetry Project, which combines the creative work of poets and filmmakers to release a video each day during National Poetry Month. VPP is back for 2018 and the poem/films are posted here for both this year and last. Cascadia is represented in this year’s collection by poet Kelli Russell Agodon and performance poet/director Corbin Louis. Have a look.